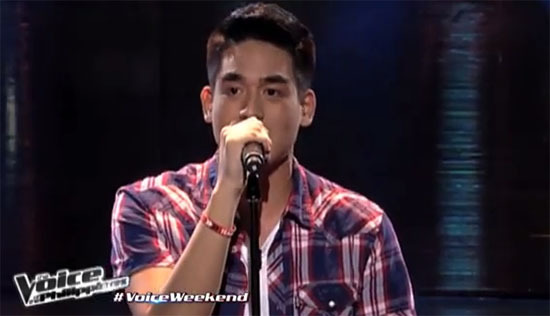 VIDEO: Jem Cubil of Cebu – – – the guy to watch in the Voice of the Philippines Season 2! Jem Cubil is a familiar sight on Philippine television. He first tried his luck joining ABS-CBN’s Pilipinas Got Talent (PGT) Season 2 in 2011 at age 17. His own rendition of David Cook’s Time of My Life during the semi-finals gave him a spot in the grand finals. He is one of the fourteen finalists who competed during PGT’s grand finals, but lost to eventual grand winner Marcelito Pomoy. Born Jose Emmanuel Cubil from Talisay, Cebu, the good-looking guy tried his luck once again via blind auditions of The Voice of the Philippines Season 2 aired on November 8. He swiftly won the nod of two judges, Apl.de.ap and Lea Salonga, who were both stunned by the mesmerizing performance of Jem with his rendition of the Kings of Leon hit “Use Somebody”. Apl.de.ap was the first to turn followed by Lea Salonga who was struck by what he saw upon seeing the artist. Coach Lea was even caught saying words like “Oh my God” and “Gwapo” (“handsome”) with a matching grin. Jem, who picked to be with Coach Lea’s team, quickly made it to Twitter’s worldwide trending list soon after that. He now becomes the second artist to join Team Lea, after Timothy Pavino the other week. The Cebu talent has strings of video uploaded on Youtube since 2011. His collection of uploaded videos include the following: I Won’t Give Up by Jason Mraz, Treasure by Bruno Mars, Little Things by One Direction among many others. As of November 8, Team Sarah Geronimo has 4 (Daniel Ombao, Kokoi Baldo, Demie Fresco, Vanessa Monot), Bamboo also has 4 (Karl Mojica, Kai Honasan, Tanya Diaz and Rence Rapanot) while Team Apl has 3 (Bradley Holmes, Mark Cando and Jannet Cadayona). “The Voice of the Philippines” Season 2 is hosted by Toni Gonzaga and Luis Manzano, with Alex Gonzaga and Robi Domingo as V Reporters.